Download and install NeoFrag for your community! The modular architecture allows optimal management of its site. Adapted for multilingual sites, the translation is maintained thanks to thecommunity. 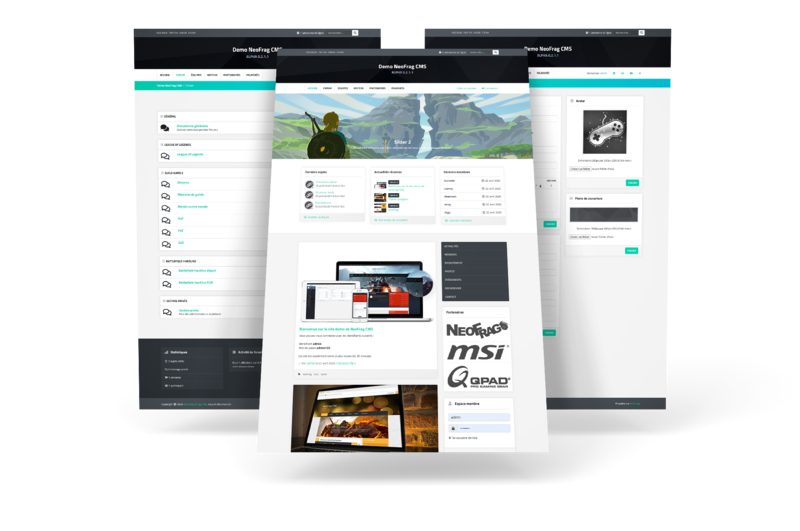 Manythemes, along with a maximum of customization options, make it possible to create unique sites. In addition to all these strengths, NeoFrag is open source and free! Customized features, designed for eSport & Gaming teams. Designed with the goal of being as fast as possible, the latest technologies are managed. The administration interface guarantees security, its access is adjustable according to the needs, with more or fewer rights. NeoFrag is a full-fledged framework that allows developers to design modules that meet any needs. Thanks to documentation and video tutorials, programming becomes easy and accessible to everyone. NeoFrag is in Alpha version, but not for long! Resumption of activity after several months of intense development. The presentation site of NeoFrag has been reworked somewhat. This project is intended to remain usable for the greatest number and this for free, but the community will be able to participate in order to perpetuate its growth. We will offer a low cost web hosting service. In addition, an offer (limited storage space) will discover NeoFrag for free. The documentation will allow the developers to take in hand the code of NeoFrag to create their own themes & addons. The community will be involved in translating the entire project thanks to a tailor-made tool that facilitates this work. The Themes & Addons module will be expanded, with many additional components, as well as premium paid themes. With NeoFrag, you can create your eSport and Gaming site quickly, without the need for web programming knowledge. NeoFrag is the turnkey solution for guilds and network gaming teams. Thanks to its evolutionary and customizable structure, create your site in the image of your community.